Looking to leave the rat race and live a quiet life? Hermits were religious individuals and contrary to popular belief not all hermits completely shunned outside interaction – some were preachers performing valuable services such as maintaining lighthouses and bridges. These hermitages were the first to appear in Britain around 400-700 AD and were home to Holy Men who lived on the boundaries of human settlements. Originally living in temporary shelters, such as caves, ruins, islands or marshes, by the 7th century the basic requirements for solitary hermitages were an oratory or chapel with a single cell and a well. Cave hermitages were adapted from natural features by excavating hillsides or cutting into limestone and cliff faces. 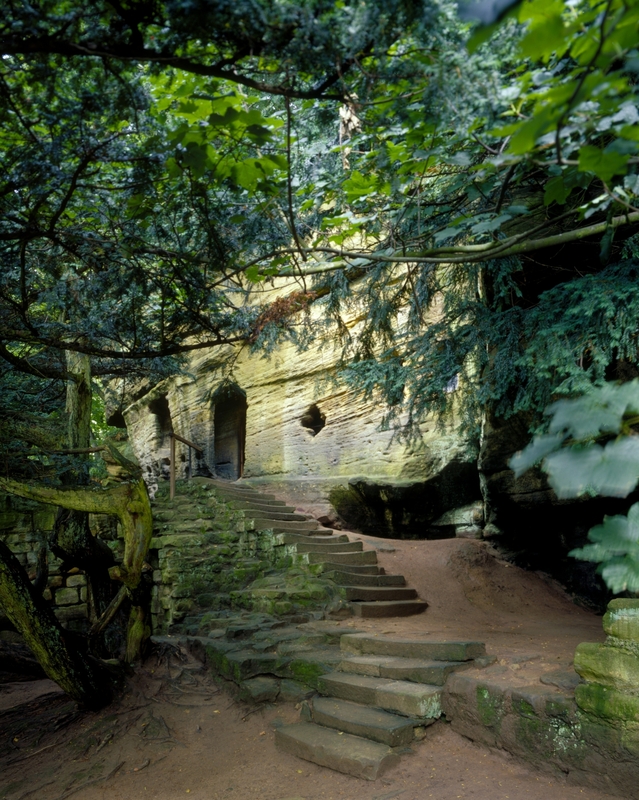 Renowned cave hermit locations are at Guy’s Cliffe, Warwick, and Robert’s Cave, Knaresborough. First appearing around the 7th century, these remote settlements were an early form of communal monasticism, consisting of men living together, each with an individual cell. Later, between 1000 and 1150 AD, a revival of eremitic monasticism took place, leading to groups of ‘New Hermits’ who wanted to live a more austere way of life, but unwittingly attracted large followings and patrons. This led to the adoption of regular monastic rule and the inevitable transformation of the hermitage to a monastery. If you’re still looking for a regular income, some hermits lived in specific chantry hermitages and granted soul-masses in return for benefactions or bequests. In 1354, Edward the Black Prince paid an annual stipend to the priest Sir William Pruit to live in the hermitage in Restormel so he could perform mass for the souls of the Prince’s ancestors. If you prefer wild weather, dramatic views and the opportunity to protect lives, consider the life of a Lighthouse Hermit. Even though the hermitage locations were on top of cliffs and promontories, the usual oratories and cells of a hermitage could be found with the addition of a tower where a light was kept burning to warn those on the sea. For those considering life as a hermit but don’t want to stray too far from civilisation, by the late 14th century urban hermits could be found. More interested in performing acts of public service than spending time in isolation, they were responsible for the repair of municipals such as bridges and highways and would beg for repair funds to cover the costs. These hermits would make ready-made structures in the town their home, including town walls and gates, occasionally becoming attached to parish churches. How often have you said ‘anything for a quiet life’? Well…take a look at this! What an intriguing story. Thank you.